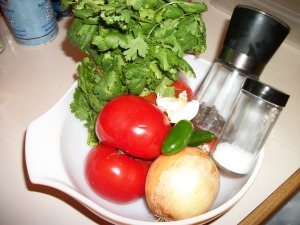 Gather your ingredients: 2 lbs tomatoes, 1 yellow onion, 2-4 jalapenos (depending on how spicy you like it), a handful of cilantro, 3 cloves of garlic, salt, and pepper. Wash the tomatoes, peel and quarter the onion, peel the garlic, and slice the jalapenos lengthwise. Turn on the broiler and move the oven rack to the top tier. Put the vegetables on a metal tray or container and broil for about 10 minutes. 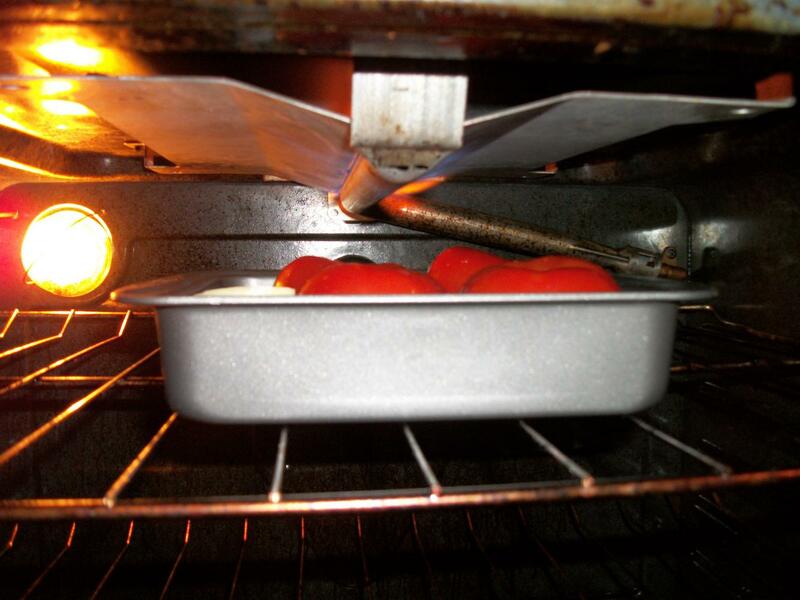 Turn the vegetables and broil for about 10-15 minutes more. 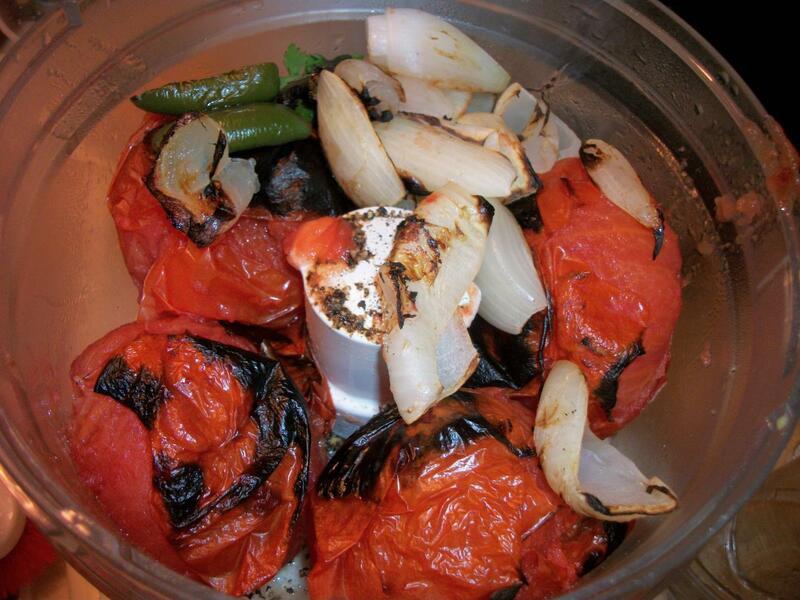 The goal here is to char the veggies. 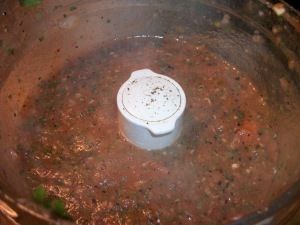 As you can see, I put the charred veggies in a food processor. Mistake #1. 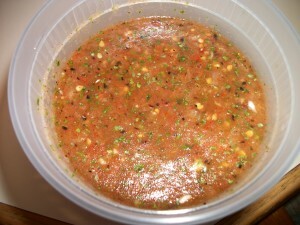 DO NOT MAKE SALSA IN A FOOD PROCESSOR. I learned the hard way. All of the liquid will leak through the middle hole. So be smart and put the charred vegetables in a blender. Look at that beautiful steamy bowl of salsa. Mmmmmmm. Many copycat recipes call for liquid smoke, but that’s not the secret. 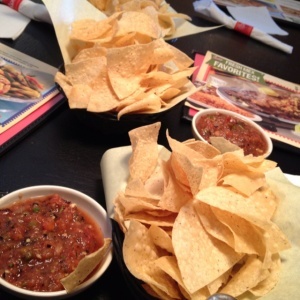 Notice the black flecks from the charred tomato skin – that’s what gives this salsa its smokey flavor. Add in salt and pepper to taste. Store the salsa in an airtight container and chill before serving. Not only do I eat this with a spoon like an animal, but it makes an AMAZING paleo salad dressing. Thanks for stopping by and enjoy! Aloha!